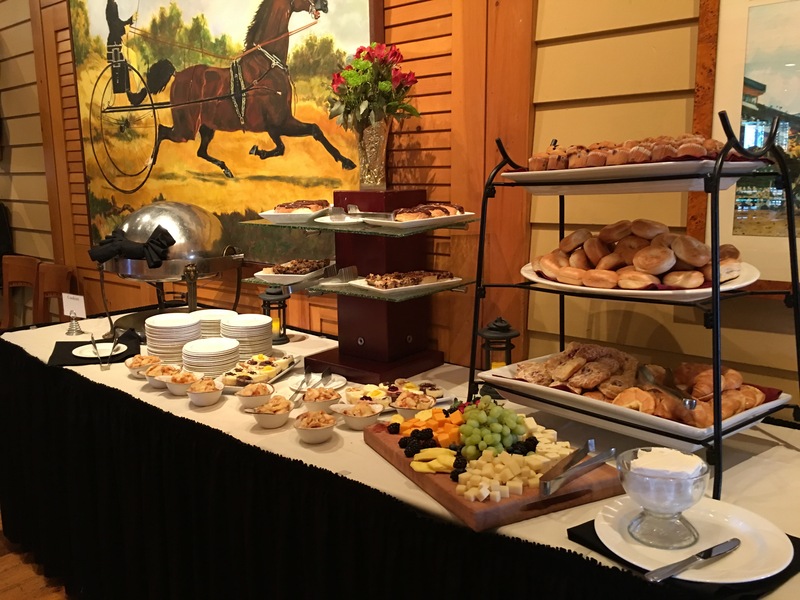 Parkers Tavern- Sunday Brunch – Go There. Try That. 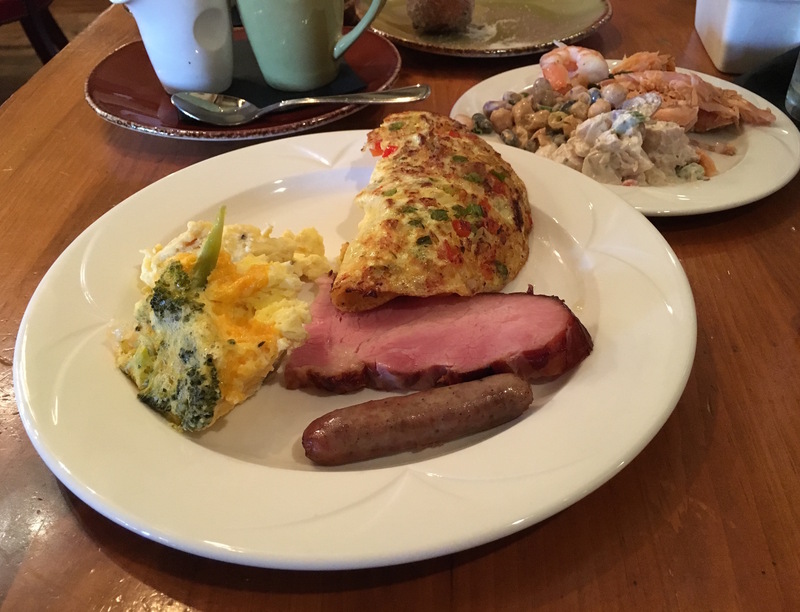 This post is all about the brunch! 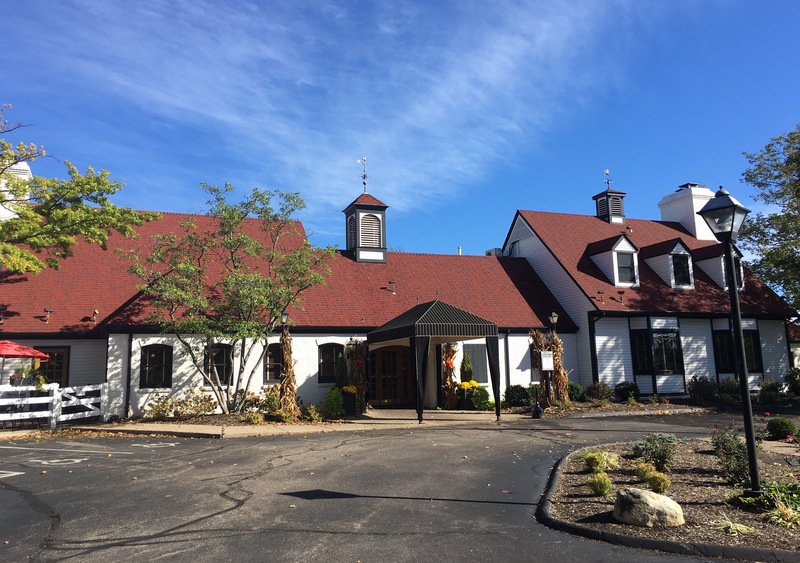 My recent visit to Parkers Tavern in Blue Ash was specifically to try their new brunch buffet menu. Growing up, we ate breakfast early! My parents woke up before the rooster crowed- so I either got up early to get eggs and bacon, or enjoyed the extra hours of sleep and settled for cereal or toast. Or, if I got up late enough, I skipped breakfast and just ate lunch because in my house, lunch was at 11:00 am. Brunch was pretty much a foreign concept to me. So, this brunch thing, this meal that was created for the purpose of enjoying both breakfast and lunch, well that’s just brilliant. My choice time to do brunch? When setting an alarm is not a requirement, and time is not of the essence. When I heard Parkers Tavern, which features American fare like steaks, prime rib, salmon, and pork chops was putting on a classic Sunday brunch, I was excited to check it out! This brunch is a spread! My best advice is to come hungry and to pace yourself! There is much to enjoy here. 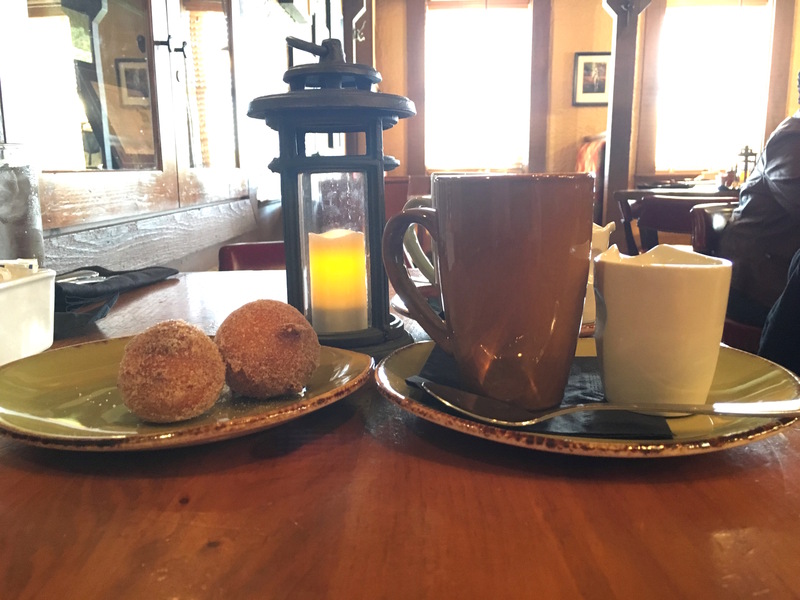 Our meal experience began when beignets were brought to the table! That coupled with my hot cup of coffee was a nice touch. I was super pleased to learn Parkers serves Coffee Break coffee because it’s a local Cincinnati roaster. With brunch, you get the choice of one regular drink (coffee, tea, soft drink) and one alcoholic beverage (Screwdriver, Champagne, Bloody Mary, Mimosa). 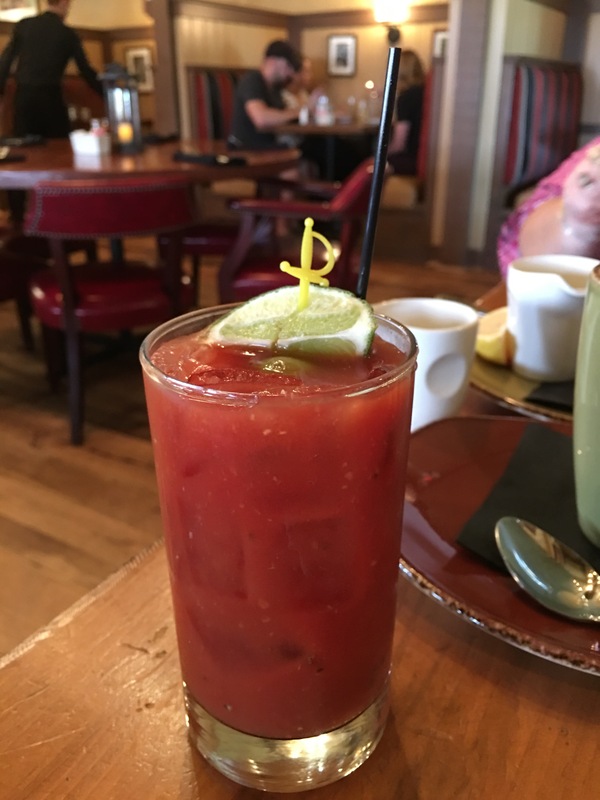 While I drank my weight in coffee, my husband had both coffee and a Bloody Mary, which, according to him, was perfectly spicy! 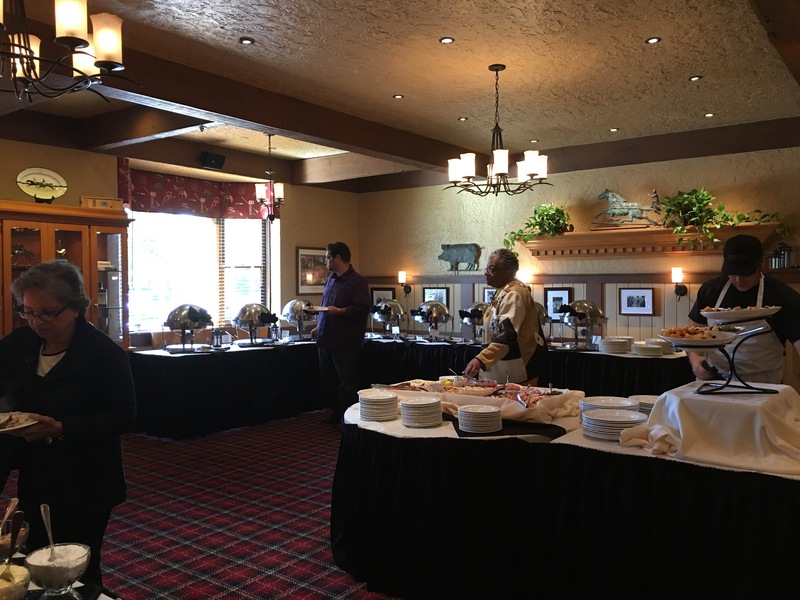 I cannot list all the items served on the brunch buffet at Parkers Tavern; in fact, I’m sure some of them change from time to time. 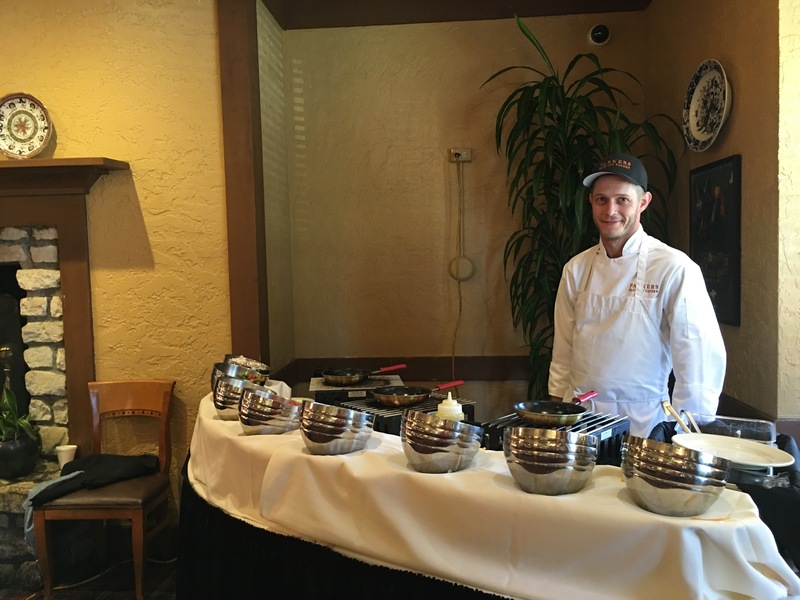 What I can say is that Parkers offers traditional breakfast items such as egg casserole, sausage links, hashbrowns (loved the crispiness of these potatoes), biscuits and gravy, waffles, and a made-to-order omelet bar. This was definitely a hit because the omelet is made fresh to order, the ingredients are self-selected, and the cheese goes in at the last minute so it’s nice and gooey! And, can I just admit that I geeked out over having chocolate chips and powdered sugar to put on my Belgian waffles?! 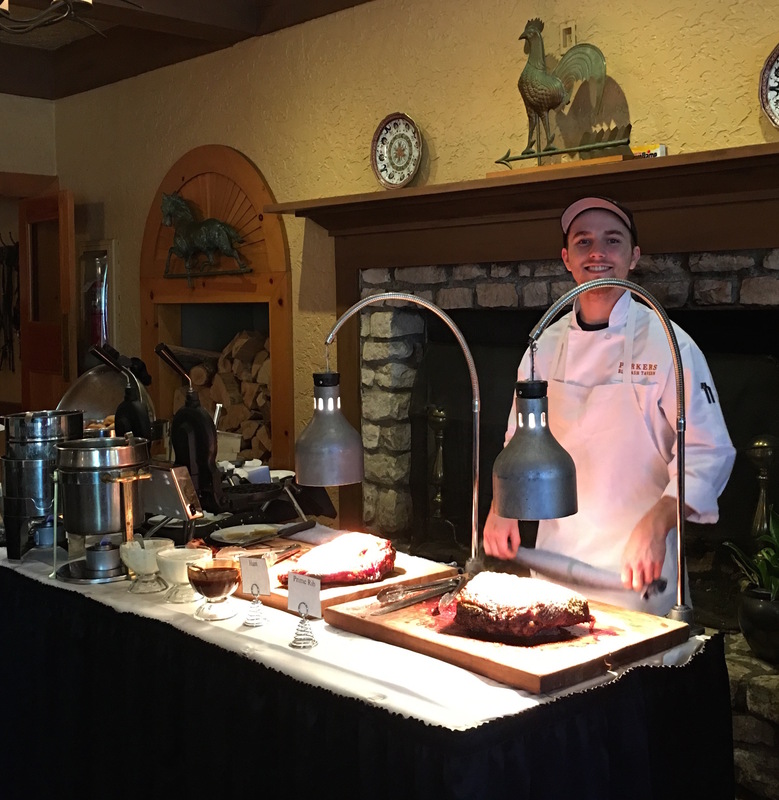 After starting with the conventional breakfast items, I ventured to the carving station which features an incredible ham with a honey mustard glaze, and my favorite, prime rib. The prime rib was well-marbled and cooked expertly. This, my friends, is the beauty of brunch! There is a salad bar section, but I will be completely honest; when I attend a buffet, I rarely eat salad because there are so many other good options. However, they do have interesting selections like cajun bean salad- this was delicious! 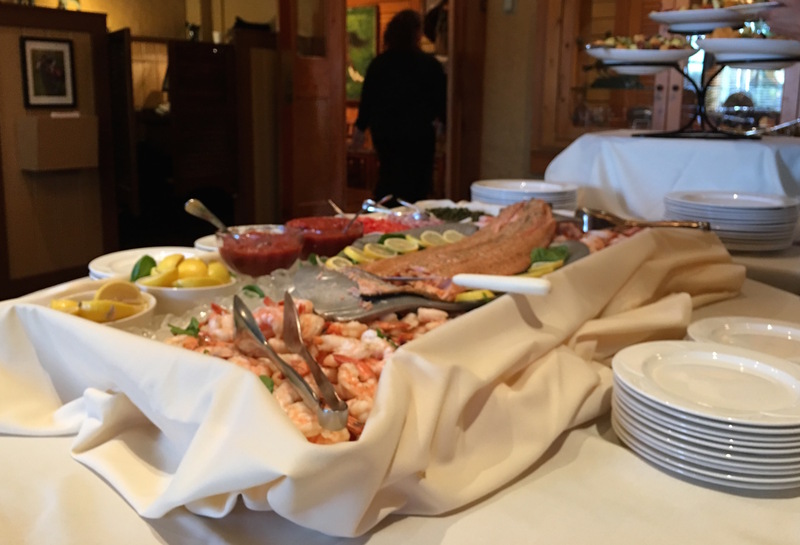 Next to the salad selection is the shrimp and house smoked salmon! Both were done nicely! As with many things at Parkers, I appreciated the little touches, like two cocktail sauces for the shrimp: one with horseradish and one without. The salmon included extras like capers, onion, and tomato. Seafood is a nice, light addition for brunch, too! So good. If you have room left (and that’s a big if), there’s a dessert bar as well. 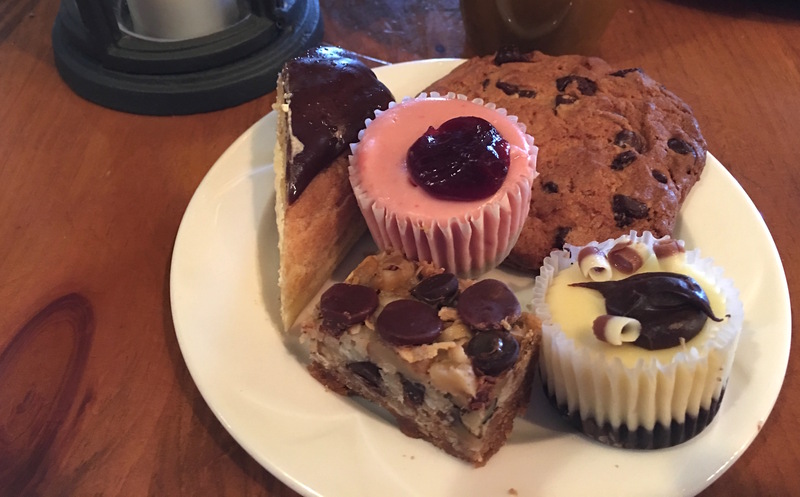 Options range from eclairs and cookies to breakfast pastries and donuts to assorted cheeses and crackers. I would be remiss if I did not mention the colonial environment of Parker’s. 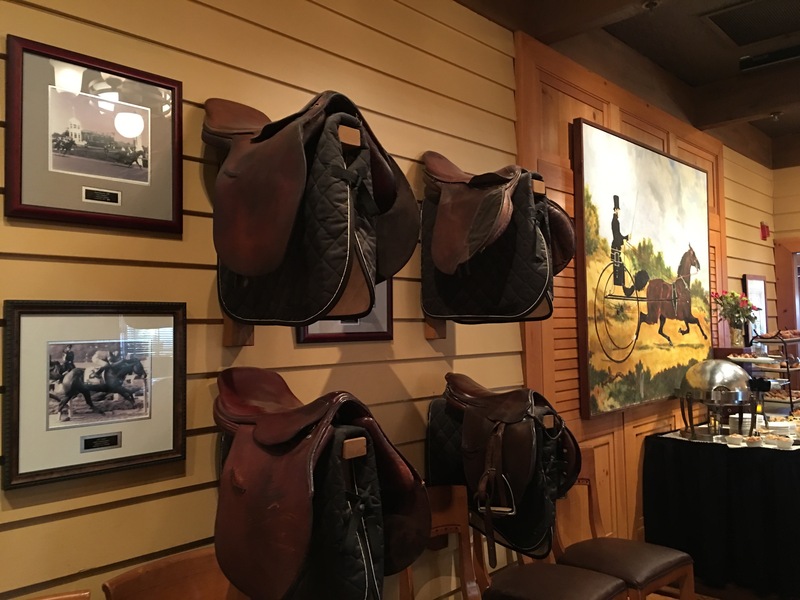 The numerous fireplaces, horse themed decor, wood floors, and warm colors are the perfect match to this classic comfort food. 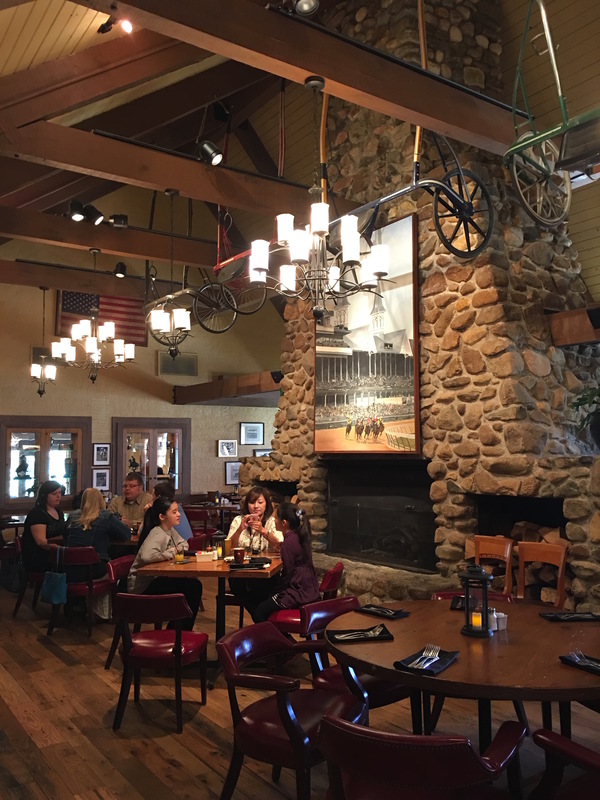 We ate in the main room with the big, beautiful stone fireplace, floor made from reclaimed barn wood, small lanterns on the tables, and vintage light fixtures hanging from the wood beams. I took a little tour of some of the other rooms and was equally impressed. It really is a lovely place to enjoy a meal. At 25.95 per person, the meal may seem a bit pricy, but there is quite a lot to choose from, the food is excellent, the atmosphere is cozy and warm, and the service is fantastic. Just show up hungry, stay for awhile, and enjoy! Remember, Parkers serves brunch Sunday from 10am-2pm. P.S.- There’s a giveaway for Parkers coming later this week! Stay tuned! GO THERE (Parkers Tavern)! TRY THAT (Brunch)! Wowsa! Everything looks amazing. My favorite thing on a brunch menu is any kind of Eggs Benny. Bloody Marys and Eggs Benedict are my brunch faves!!! Looks like an amazing brunch. 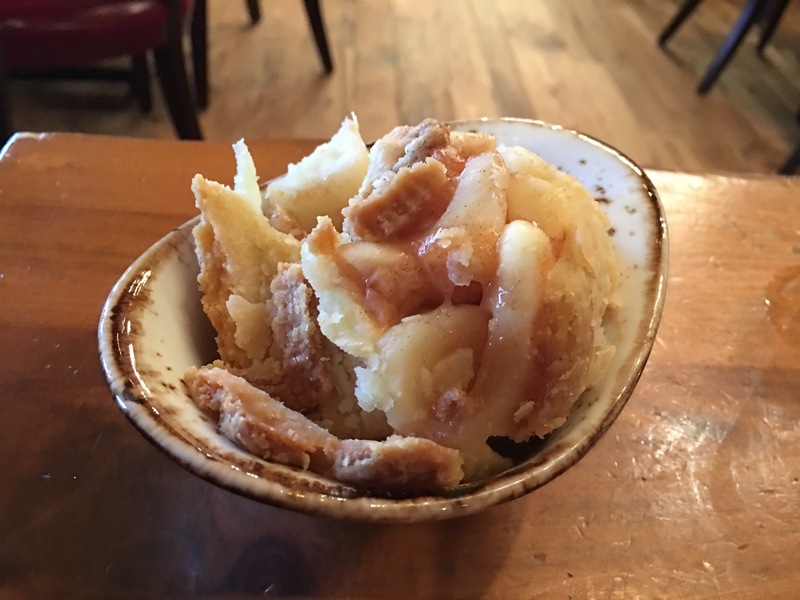 I love good potatoes of any kind at brunch. The hashbrowns at Parker’s sound great. What a what what?!?! I mean seriously!!!!!! I’m salivating over here!!!!! Goetta!!!!!!!! Did they have Goetta? 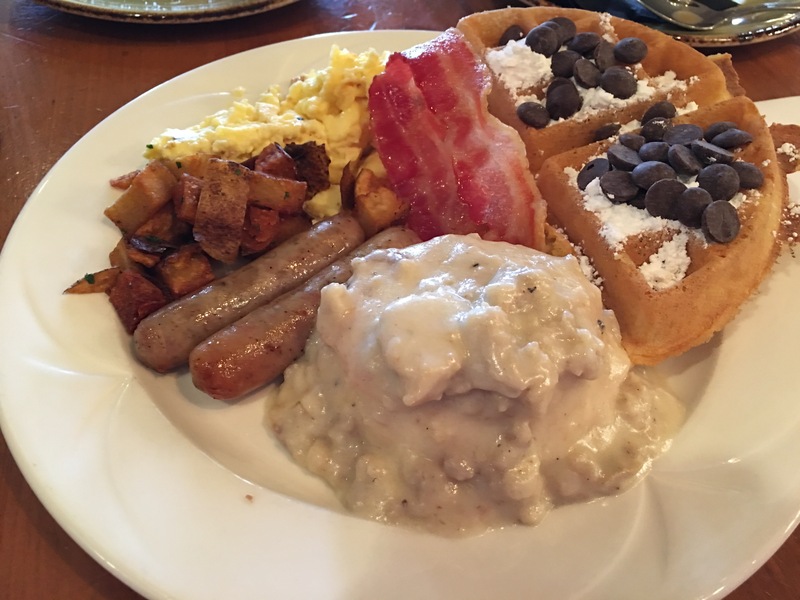 That’s definitely one of my favorite brunch things…and then if there’s no Goetta: biscuits and gravy!!!! I’d love to see some delicious pancakes, but I guess waffles are just as good! As much as I adore brunch, I’m afraid I will not be spending my hard earned money at this establishment. After a disappointing birthday dinner for my Mother and four guests ( bad food; poor service; over pricing for portion size) I have chosen to never set foot in place again. I’ve only been for brunch and that was great! I haven’t been for dinner yet.